NIA kick started its new webinar series 'Nano in Action' with a focus on applications into textiles. Matthew Tipper, Nonwoven Innovation Research Institute (NIRI): NIRI is a specialist industrial research centre in the UK and Matthew presented the diverse ways in which nanomaterials can create textiles and also be incorporated into textiles. Gregor Schneider, RAS AG: NIA Member RAS presented its own industrial case study concerning the incorporation of nanosilver into cleaning materials and the highly beneficial impact of the biocidal functionality on energy efficiency materials, with a 30% reduction in energy over a cloth's lifecycle. 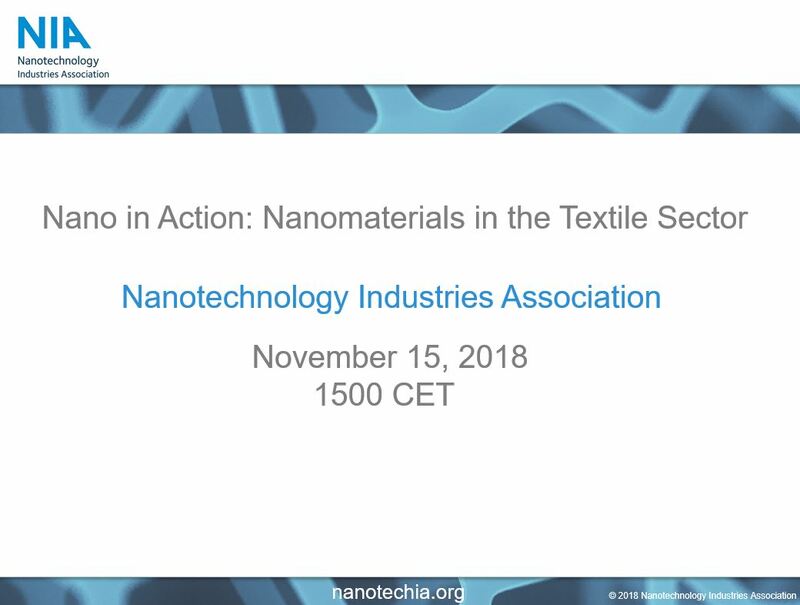 David Carlander, NIA: David wrapped up the webinar with a look at the regulatory and standards framework in which nano-textiles operate, including increasing nano-specific text in REACH and sector applications. The webinar then moved to a Member-only discussion session, addressing specific aspects of the presentations and connecting Members across a common interest in textile applications. If you missed it, you can catch up with the recording on YouTube HERE. With over 40 registrations for the webinar from Europe and North America, NIA was delighted to bring together a diverse audience as part of its mission to showcase nanotechnology in application. NIA has also launched a 'Nano in Business' webinar series, starting in January to look at the commercial drivers that shape nanomaterial development. The webinar is open and delegates can register HERE.